Of course, we all know that these mottoes are referring to the tragedies of the September 11, 2001 terrorist attack within the United States. For the past ten years, we as Catholics — and as citizens of the United States Of America — have been journeying through unfamiliar and disturbing events in our nation’s history. We witnessed the horror of the World Trade Center towers crumbling, and the Pentagon ablaze, a jetliner ditched in Pennsylvania to keep terrorists from using it as a missile. Many people are still victims: spiritual victims of those terror attacks. These spiritual victims are frightened and sad, and suspicious -- suspicious about the future, suspicious about placing their trust in something that will not be able to prevail and endure. 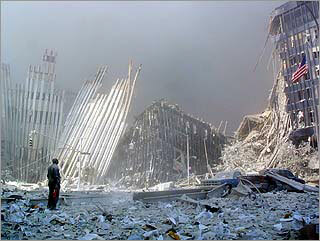 Many spiritual victims think that everything we know and love will end up like the Trade Center Towers and the Pentagon. No, it will not end up that way. It will not! Because of a weapon that we have been given. A supernatural, spiritual weapon. For a few minutes, let’s examine the weapon we have been given by Our Lord to help us to conquer all fear: Hope. The 1969 New York Mets (talk about hopeless!). When all human societies and institutions were toppling and disintegrating; When people were surrendering to hopelessness; Only one reality survived and grew and provided a foundation for human society to rebuild and reform with hope of improving. That one reality that has stood the trials of history and evil – is the Holy Catholic Church. In the Catholic Church, Our Lord Jesus gifted human beings with an indestructible foundation and a never-ending source of hope. His Church is us: you and me, and all our faithful sisters and brothers in every land. We are the signs and sources of hope to the world. Through us, His Church, God announces that He is never absent and forever at work in our world, even in the midst of the world's woes and problems. You and I must be sources of hope now, in our time! How? How can we live in hope so that we are able to give hope to others? First, we must draw hope from the well for ourselves. Where do we find that well? In the glory and joy awaiting us in our future life with Christ in his heavenly kingdom! That joy and glory are so surpassing, they cannot be contained or held back! They are already spilling over from our future life, already being reflected in the present moment, now, in us! The whole intention of the Church's hope focuses upon Christ's return. It is a future near at hand. We are expecting it. We anticipate it so dearly, that we keep ourselves vigilant and patient, so we may be permeated by hope. That hope permeates the entire Church, all of us, because the Holy Spirit fills each of us. The Holy Spirit in us desires to fill us with faith, and hope, and love. We can stimulate that hope within us by living in ways that lead us to offer ourselves to do the will of God. We provoke that hope by lives of chastity and purity in all we say, do , feel and think. We can energize that hope within us by living lives of fidelity to prayer and to reading God's promises given us in the scriptures. We need to remind ourselves, excite ourselves, renew our hope by entering with the Holy Spirit into the Scriptures again and again, growing progressively deeper and more intimate with the Lord as He reveals Himself to us through His Sacred Word. We also bring our hope to life by our mutual forgiveness of each other, by our mutual love and concern and self-sacrifice for each other. And, we especially re-fuel our hope whenever we gather together to partake of The Lord's Supper, celebrate the Holy Eucharist, which unites us as members of the Mystical Body of Christ on earth. Never forget the victims: those who died ten years ago – and the many spiritual victims living among us -- starving to death spiritually since 2001. Spiritual starvation is the result of lost hope. Our Lord Jesus commands us to revive these victims, and renew them. To accomplish this, we must first draw hope from the well for ourselves. Then, we pour out that hope into other people's lives -- and do it with joy and with the utmost patience, even in times of hardship and suffering -- because, hope is our response to God's promises given in Jesus Christ. Our hope springs eternally from the security of knowing that God is loving us and sending us -- in faith and with hope -- to love His fearful and starving children. Through His Holy Catholic Church, Our Lord Jesus is with us, right now, as He promised He always would be. We can look forward to the future with the hope of rising again -- rising in triumph from any terrorist attacks and warfare and losses — rising to new, transfigured life with Christ. Long Live "The King Of Instruments"!